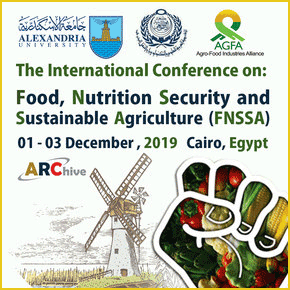 The first international conference on Food, Nutrition, Security, and Sustainable Agriculture (FNSSA) will be taking place in Cairo from the 1st – 3rd of December 2019. The conference's main theme sheds light on "Innovations and advanced technologies in food industrial processing". This will not only give the chance for researchers and experts across the globe to come together, but it will also allow them to perceive new scientific innovations in the field, and find more efficient approaches.